Isabella Marie Swan, known as Bella Swan, is a fictional character from the Twilight series by Stephenie Meyer. The series is told from Bella's point of view, with the exception of the epilogue of Eclipse and the series' upcoming companion novel, Midnight Sun. Isabella Marie Swan was born on September 13, 1987 to Renée and Charlie Swan, a young couple living in the small town of Forks, Washington. Bella's parents divorced when Bella was six months old, and Renée took Bella with her when she moved to Phoenix, Arizona. Very little of Bella's life in Phoenix is mentioned, although she does allude to not fitting in very well at her old school, never having any romantic relationships or many friends, and that she spent a lot of time with her mother. She mentions taking piano lessons and having a few pet fish. It is also known that she used to take ballet lessons in a studio near her house. At the start of the first book, Bella's mother has recently married Phil Dwyer, a minor league baseball player who is much younger than herself. Phil travels a lot due to his profession, and Bella notices how much her mother wants to be with him while he travels. So, to make it easier for them, Bella moves back to her birthtown of Forks, Washington, to live with her father Charlie Swan. She enrolls at Forks High School and notices that the boys there are immediately attracted to her, although she dismisses their advances. She makes a few new friends, including Jessica Stanley, Angela Weber, and Mike Newton. 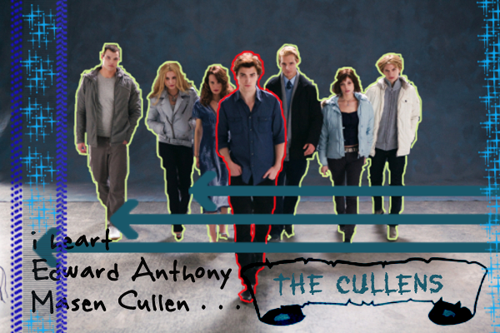 The one group of people at Forks High School that truly intrigues Bella are the Cullens, a mysterious family consisting of five adopted children. Edward Cullen, in particular, captures her attention. As the story progresses, Bella finds out from a family friend, Jacob Black, that the Cullens are supposedly vampires. However, they are different from other vampires in that they are "vegetarian" – that is, they substitute animal blood for human blood, refusing to hunt humans. As Edward and Bella get to know each other better, it is hard for Edward to be near her, because her blood "sings" to him. Although he does not drink human blood, Edward constantly lusts for it, and Bella's blood is especially tantalizing for him. He must constantly control his desire. He also finds that his mind reading capabilities do not work on her. Eventually, the two grow closer and declare their love for one another. Edward introduces her to his family, and soon after she is invited to watch their baseball game. During the game, danger reveals itself in the form of a visiting vampire coven consisting of Laurent, Victoria, and James. Victoria's mate, James, is a sadistic tracker vampire who has set his sights on killing Bella. Edward and his family save Bella and destroy James, though the other vampires of his coven, Victoria and Laurent, survive. Bella escapes death with broken ribs, a broken leg, multiple fractures, bruises and a permanent crescent-shaped scar on her hand where James had bitten her. She spends time in a hospital with Edward constantly by her side, where he admits that his sister Alice saw a vision of Bella becoming a vampire. However, he is determined to keep her human, despite her own determination to become a vampire. 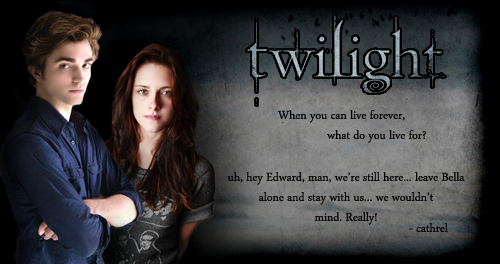 The reasons behind his intentions are revealed in New Moon. At the end of the novel, Edward takes Bella to their prom, despite her broken leg and angry protests. There are high levels of tension as the book ends, caused by Edward and Bella's differences of opinion about turning Bella into a vampire. Not so pretty and not so ugly. Perfect. :] I wish I'm as lucky as her, fictionally. :] HAHAHA. haha.. of course he is! not that ugly not that beautiful as well..
she's not the kind of girl that make your jaw drop, man... haha... she's just a typical girl who fell in love with a gorgeous dude. period.